Also in 2005, SambaDá crossed paths with Grammy-nominated music producer Greg Landau to create the 2007 release “Salve a Bahia”. With “Salve”, the band created a new sound that not only paid homage to folkloric music but also captured the spirit and musical background of each band member and added a modern, funky edge. The recording project and the bands’ live shows also grew from the collaboration with two more talents from Bahia, Brazil, percussionists Marcio Peeter and Wagner Profeta. Marcio and Wagner bring their deep percussive knowledge and groove to the studio albums, as well as to the stage. Following the success of “Salve a Bahia”, the band collaborated on a second album with Greg Landau, the album “Gente” which was released in the spring of 2010. 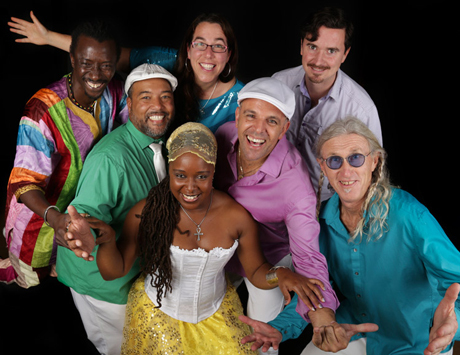 “Gente” vibrates with the inspiration of the band’s first tour to Brazil in July 2009, and reflects their desire to share their dedication to Brazilian music, with some unique California flavor, with audiences everywhere.